An elegant door will bring a personal touch of style to the entrance of your home. For either front or rear entrance doors, we offer a wide selection of composite doors in an exclusive range of colours and woodgrain finishes. 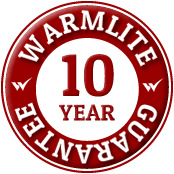 Warmlite are independent suppliers & installers of high quality composite doors. Composite doors bring the benefits of the durability and ease of maintenance of modern materials with the appearance of a traditional timber door and at a fraction of the cost. All Warmlite composite doors come with a 70mm steel reinforced UPVC door frame with a triple weather seal. They have a rigid polyurethane foam core and a fibreglass outer skin which has a deep texture like a wooden door. This combination provides a very strong door which is nevertheless relatively light weight and easy to open. A wide range of door styles can be supplied by Warmlite, in a choice of many different colours. Composite doors can be further tailored to your home by adding decorative glass (stained glass, leaded glass or Georgian bars), and your choice of door furniture. (handles, letterplates, and knockers). Composite doors can be fitted within traditional arched designs, and supplied with sidelights or toplights (windows above and to the side of the door) as required to match the style of your home. Warmlite composite doors have a Winkhaus “Cobra” multi-point hook/deadlock locking system tested in accordance with PAS 23/24 security standards. The composite door hardware includes Lever Pad handles with integral spring return cassette and an anti pick, anti drill door lock cylinder. Based in Tolworth, Kingston Warmlite are designers and installers of high quality replacement composite doors. Our experts will listen carefully to your requirements, and will guide you through the different composite door options available, including colour, decorative glass and door furniture choices. Looking for the ultimate in security and strength? While all our composite doors are installed with the utmost care and attention you may require an even stronger more secure option for you home or property. Why not take a look at our extensive range of Solidor composite doors, we are an recommended Solidor installation supplier. For further information about our range of composite doors, a free site survey with a no obligation quotation or to arrange an appointment.